Of the most prized jewelry pieces, there’s nothing more personal than your engagement ring. After all, it’s not only a profession of your commitment to your S.O. but it's also kind of an extension of who you are. When you’re choosing an engagement ring, there are a lot that factors into the mix, including cut, color, and style. In order to make your engagement ring decision as educated as possible, we're here to inform you of the engagement ring trends that will die as we exit 2018 and enter 2019. As for Zhang, she feels that rose gold rings have been declining, and instead are opting for traditional metals like yellow gold. 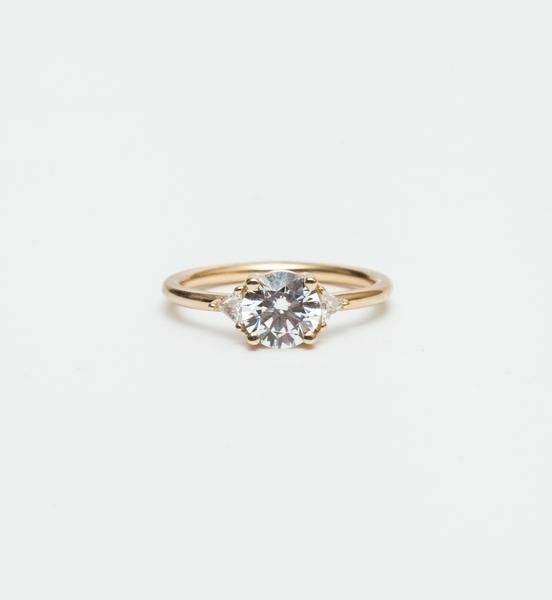 “Towards the end of this year yellow gold has been the most popular metal choice and I know it will continue to be popular in 2019.” Whether you’re on the brink of getting engaged, or you’re simply updating your Pinterest board, shop the rings that brides are loving for the next year below. This will never feel out of style. The center stone is absolutely gorgeous. Any minimalist would love this ring. We love this unique setting. It doesn't get more unconventional than this. This celestial-inspired ring is so pretty. This will feel as unique as you. A sapphire ring is so unique. This color is to die for. This was made with the unconventional bride in mind. For the minimalist who wants an edge to her ring. You won't be able to take your eyes off. This will look so good when you add the wedding band to it, too. We can't get over the diamonds on the bands. Planning your wedding? These are the dress trends you need to know.